Thus the climate argument careens between catastrophism versus hopetivisim—which is a word I made up embodied by those tedious songs at the end of every environmental documentary film. Watch An Inconvenient Truth or Cowspiracy or that dreadful Josh Fox flick, and you’ll see this formula. Hopetivism is the earnest, condescending notion that if we all just join arms and feature the dance performance of an indigenous person in our self-indulgent movie we can Kumbaya our way out of the slow-rolling nightmare that is humanity’s war on the biosphere. Perhaps the question then is where do we stand? Give me the data: where’s the hope? The new book Drawdown: The Most Comprehensive Plan Ever Proposed to Reverse Global Warming tries to provide a realistic roadmap to that hope. Editor Paul Hawken and senior writer Katharine Wilkinson have assembled an epic, meticulously researched tome featuring a 120-person Advisory Board of scientists, economists, politicians, and activists. The book tours 100 ideas for reducing humanity’s greenhouse gas addiction, solutions we can implement now with technology we have now. It then advances sober, realistic estimates of how many gigatons of carbon each plan could remove from the atmosphere, how much it will cost, and the net savings. Much of Drawdown will be familiar territory to anyone keeping abreast of the climate and energy debates, from the expansion of wind turbines (#2) to rooftop solar panels (#10) to green roofs (#73) to regenerative agriculture (#11), and many more esoteric ideas (multistrata agroforestry, anyone?). There have been other books in this genre, including Daniel Yergen’s The Quest and Amory Lovins’s Reinventing Fire. Drawdown distinguishes itself by expanding its scope beyond energy, transportation, and agriculture to women’s education and family planning. According to the authors, these come in at the #6 and #7 most important climate solutions, respectively. So here’s your hope: climate change is no longer a technological problem. From the solar panel to the IUD, we have enough engineering know-how to avert the Mad Max scenarios. We can do this. Climate change, however, has morphed into a political and cultural problem, which actually makes it more frightening, not less. Please forgive that much of my critique of Drawdown lies outside of the book’s actual scope. It is a gorgeous, intelligent encapsulation of the ideas and opportunities being put into motion by dedicated and occasionally courageous individuals all around the world. But don’t start playing the saccharine song just yet. Let’s begin with the fact that it’s impossible to ignore that most of the solutions proffered would be unleashed, ramped up, and put on steroids if the United States would just put a price on carbon. Want cities to retrofit buildings (#80)? Want to encourage energy cogeneration (#50)? Want to find out if fourth generation nuclear plants are viable (#20)? Want to create a market for “coming attractions” like carbon air capture? 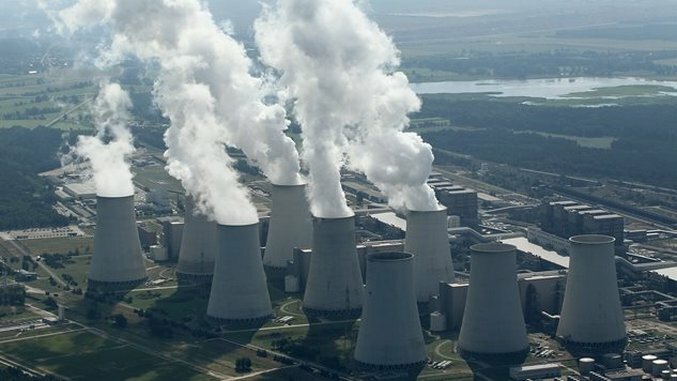 Put a goddamn motherfucking steadily rising price on carbon. That the path forward could truly begin with just one robust piece of legislation is one of the most tragic parts of our predicament. Simply put, many of Drawdown’s solutions require government taking the lead. Biomass (#34), for instance, is “imperfect, riddled with caveats, and probably necessary.” It requires appropriate feedstocks such as waste products or sustainably grown energy crops to actually be carbon negative. Geothermal (#18) would be a great way to provide baseload power when the wind isn’t blowing and the sun isn’t shining, but it almost certainly needs public investment and “agreements that guarantee power will be purchased from companies that develop it.” The book details a host of ideas for better agricultural practices, from managed grazing (#19) to tree intercropping (#17), and these would best be encouraged by loans and subsidies. Behind all these solutions are lobbies losing a lot of money, and those lobbies currently control, nearly lock, stock, and barrel, the two main political parties in the most powerful country in the world. Writing the forward, billionaire and founder of NextGen Climate Tom Steyer calls climate change “a global crisis with no place for partisan rhetoric.” That is, at best, deeply naïve. The most powerful constituency in the history of civilization is the industries that comprise the fossil fuel lobby. Big Agriculture, currently feeding the majority of the planet’s seven billion people, is not far behind. That money and power is not going to go quietly. These interests will fight like hell to maintain the status quo. Their current proxy is the Republican Party, many Democrats, and an armada of propaganda organizations who’ve convinced a good number of Americans, including the current president, that global warming is a hoax. The problem is not that we don’t have enough ideas to solve climate change. The problem is that for a generation, certain interests have also been circulating internal documents that might as well be called PumpUp: 100 Ideas to Forestall Action on Global Warming and Profit from Inevitable Civilizational Chaos. Drawdown notes that in 2015, subsidies for fossil fuels totaled a staggering $5.3 trillion worldwide, according to the International Monetary Fund. In other words, we are paying 6.5 percent of global GDP so these industries can burn our home to the ground. Meanwhile, the solutions are held hostage. Take energy microgrids (#78), an excellent, “no regrets” idea that would save energy and make our lives more resilient to disruption from blackouts, natural disasters, or cyber attacks. What’s the obstacle? Similarly, utility companies stifle the development of energy cogeneration while waging a fierce state-by-state war against rooftop solar because those panels are a huge threat to their profits. This year, the installation of rooftop solar has come to an abrupt halt thanks to furious lobbying by utility companies. What about #52, saving and restoring coastal wetlands? Just take a look at Florida where these obvious, no-brainer plans are laid to waste by real estate developers. Yet this industry is so entrenched, particularly in politically vital states like Iowa, that in 2014, when Steyer’s NextGen Climate volunteers scoured college campuses for voters, they were actually promoting corn ethanol as a solution (and had to endure my miserable rants in which I pulled up statistics on the climate impact of nitrogen fertilizers on my phone to wag in their faces). Climate ultra-denier Joni Ernst, ended up winning the senate campaign NextGen had hoped to sway. The point being that we have a political system that operates first and foremost for the benefit of massive industries, which easily bend the policy-making process to their will. However, beyond the intractable political problem—and possibly even more vexing—are the cultural issues identified sub-audibly amongst Drawdown’s solutions. These are the contradictions inherent to the movement itself. In the countries where women’s untapped potential would be most beneficial, girls are mutilated at birth, denied education, married off as teenagers, and generally treated as chattle. The West has a lot of issues—materialism, industrial agriculture, Ted Cruz—but there’s no way around the fact that the push for women’s rights is, in some cases, the Global North telling the Global South how to do things. Even if it is fair and right and just, it’s still a form cultural colonialism, the asymmetrical influence of one group of people with more economic, military, and communications power over another. while trying to attend school. America’s colonial occupation is basically the only reason these gains have been possible. Increased funding for girls’ education is vital, and perhaps should become a centerpiece of foreign aid practices, and yet one sincerely doubts that even liberal interventionists are prepared to jaunt around the globe trying to educate women in dysfunctional or failed states at gunpoint. Similarly, when it comes to overpopulation we don’t need any cruel Malthusian one-child policies. All that’s needed to reverse exploding demographics is to give women access to family planning. Yet within the pages of Drawdown, you will find a treatise from the head of one of the world’s greatest enemies of family planning, Jorge Mario Bergoglio, otherwise known as Pope Francis of the Roman Catholic Church. To some degree, we are all climate hypocrites, but as the head of one of the most anti-women organizations on Earth, Bergoglio surely must take first prize. Though he receives endless praise for his encyclical on the environment and his relative progressivism, he remains the head of a corporation dedicated to keeping birth control out of women’s hands. This is not theoretical. Look at the Philippines, the third largest Catholic country in the world, with a population that has exploded to over 100 million in the last three decades largely because the Catholic Church fought tooth and nail against contraception. Not only does the staggering increase in sheer numbers help create endemic poverty but when climate disaster strikes, as it did in 2013 when Typhoon Haiyan killed 6,300 people, the death toll and destruction are made significantly worse by overpopulation. Though the Catholic Church and House Republicans (who recently tried to tell the Department of Defense to not study climate change’s impacts on military preparedness) are worthy punching bags, there are few truly blameless political factions. Our “objective” corporate media rarely treats climate as anything more than a peculiarity while running hopeful multiracial ads from Exxon-Mobil. The vast majority of people are busy with their lives, apolitical, uninterested in these bizarre food fights with strange acronyms—PPM, GHGs, or CH4. The slipshod attention span of leftist activists, the world’s most natural climate hawks, careens from health care to police abuse to abortion rights to #NoConfederate, and it’s not as though these things don’t matter—they certainly do—but if we don’t get this one very specific issue right, none of it matters. In order to communicate to people how deadly serious this situation is you will naturally frighten them in the process. There is no way around it. Yet if I could engage in a piece of hack hopetivism to end this, let me say that in reading Drawdown you do get a glimpse of the world that could be. You read about the possibilities of restoring ocean ecosystems through marine permaculture or smart highways that soak up solar power and prevent traffic fatalities or living buildings that create more energy than they use, and you are awakened to all the possibilities inherent in the kind of technological, civic, and spiritual revolution necessary to actually overcome this moment. You become floored by the notion that the world you now know will vanish beneath a deluge of seemingly impossible achievements.